My last post briefly described the process used to deliver eReaders to reluctant readers in my school. Because this just recently happened, it will be a while before I can share any type of data about the results from this project. In the meantime, there have been a few requests to share some of the research that led to our decision to implement this technology in our book club. You can find all of the sources I referenced at this Diigo link, with what I found important highlighted. I will continue to add to this collection of studies. For a more concise explanation of the process we used to determine that eReaders might increase student’s reading skills, here are the steps we followed. Our students were pretty exuberant about being invited to be part of a book club in the beginning of the school year. They had new titles to choose from. They were all of high interest and at their reading level. Two adults were available, not to teach but rather to guide as the students gained confidence in a literate environment. Snacks were provided. They got to listen to a good story read aloud by a teacher every time they met. As the year pressed on, the reality started to set in that these reluctant readers were coming to book club after their regularly scheduled school day. Attendance started to drop. A lack of engagement showed itself in a variety of ways. It was obvious that enthusiasm was waning. What to do? When I have talked to these students (mostly boys) outside the context of school, I have found them most enthusiastic when they speak about video games. Whether the subject is Minecraft or Call of Duty, their excitement rises several notches as they discuss strategies and experiences they associate with these forms of media. It is obvious to anyone within 20 feet of these ten and eleven year olds that technology holds their attention like none other. Somewhat related, I used to share relevant education articles with my staff via Springpad. It is a very useful web tool for curating information. The only problem was, none of my staff were using it. They were all on Pinterest. Now, did I force my teachers to start using Springpad? Of course not! I got myself a Pinterest account and started posting important teaching articles for them to find and read. My purpose for using these technologies was not to simply use them, but to communicate information with others. Reading is all about communicating and understanding. It is the science of making sense of words. There are a lot of conversations out there about the pros and cons of digital texts in schools, and some have been helpful. For example, we chose the Nook Simple Touches because we didn’t want a tablet device or even a backlit eReader to disrupt the sleep patterns of our students late at night. They need the rest. Yet, another article cites research that there is no discernible affects between eInk and LCD screens. This source contradicts the other. Which research is more reliable? Even if there is a body of research showing one thing, there’s a tendency to look at one article that counters. What I knew at a prior time may have changed as I learned more (paraphrased). What this means to me is we need to read each study about reading and technology with a discerning eye. This is why I value the collective knowledge shared by Doug Fisher, along with other education researchers such as Richard Allington, Sheila Valencia, Nell Duke and Peter Johnston. They look at many studies about a topic before making any recommendations. There are pundits and columnists out there who coud learn from this process. For example, there are at least two writers for the magazine Time (Lisa Guersney and Annie Murphy Paul) that tend to represent a research study as truth, instead of what it really is: A lone study. Don’t get me wrong. I enjoy reading their columns. They share information that is important for everyone to know. But what separates these two from true disseminators of educational information, such as Kim Marshall of The Marshall Memo, is a) they are not educators, and b) they seem to espouse this information as infallible. 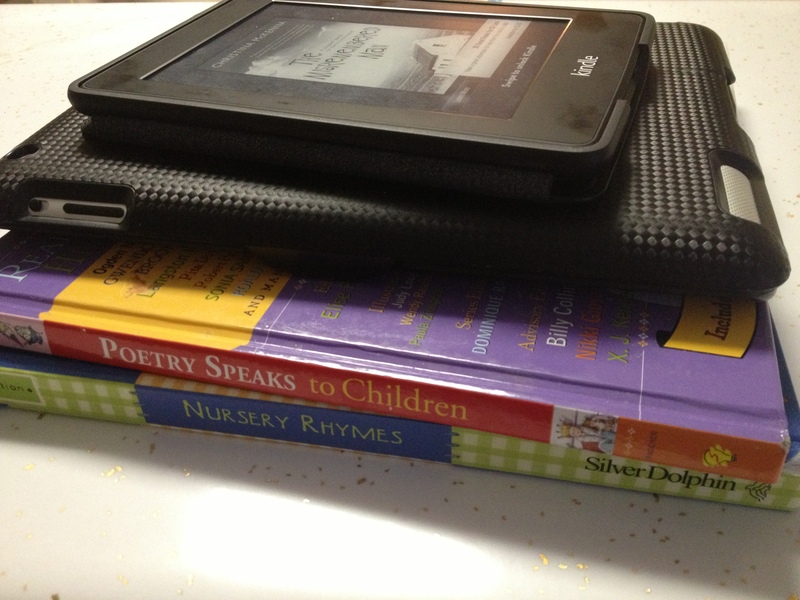 For example, Lisa Guernsey defined “e-reading” as three year olds watching eBook apps on an iPad. While I share her concerns, there was no effort to define eReading in the broader sense and clear up misconceptions. The concept of “screen time” is no longer relegated to sitting a toddler down in front of a television. Research out of context is when studies aren’t placed side-by-side with related studies. For me, I will continue to keep an open mind about how technology can possibly enhance, or harm, literacy skills with students. Of all the studies I have discovered, the one I find most interesting comes from the Pew Research Center. It found that digital reading is on the rise and print reading is down. At the same time, people read more when they read eBooks. Now, there are oodles of research to support how the volume of reading is correlated with an increase in reading habits and abilities (see the researchers I mentioned previously). Like I said in my previous post, words are words. Reading happens in one’s mind, not in the text or in how it is delivered. Both print and digital texts should have a place in schools. This helps me feel confident that the professional decisions made based on what we know at this time along with our assessments of our students’ abilities and interests is in everyone’s best interest. Thanks for sharing your journey and thought processes! We’re also considering a tablet purchase, and it helps to see what others have considered and why they made the decisions they did. I look forward to hearing more about the results! Great article. I agree not all screen time are equal. There are good screen time, and not so good screen time. We should engage kids more with good screen time, and limit the other; just like we want our kids read good books, not bad ones.